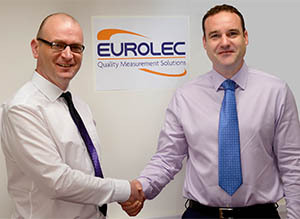 Global instrumentation leaders Scientific Measurements Pte Ltd has acquired Ireland-based Eurolec Instrumentation Ltd for an undisclosed sum. Scientific Measurements – parent company to Cirrus Research and Acoustic Instruments International – has more than 40 years’ experience in the sector and counts product ranges Optimus, Revo, doseBadge, Trojan and Invictus among its industry-leading brands. Eurolec as a brand and trading name will continue within the Scientific Measurement fold, with the existing head office remaining in Dundalk, County Louth. Its chain of distributors will also be unaffected. Coinciding with the handover, Eurolec founder and Managing Director Tom Mears will be retiring after a five-decade career in the sector and 19 years since establishing the company. Chris Mears has been appointed the new MD, formerly heading up the company’s sales & marketing. The rest of the Eurolec team will remain unchanged by the buy-out. Moving forwarding, product enhancement and development are a key priority for the new owners and its experienced marketing team will begin work on an updated website for its newest subsidiary. “This is a new chapter for the company but we have inherited a strong legacy from Tom and a great platform to build upon,” said Daren Wallis, Scientific Measurements Director. Scientific Measurements Pte Ltd is now the owners of Eurolec Instrumentation Ltd (known as Eurolec Instruments). In turn, Scientific Measurements Pte Ltd are also the owners of Cirrus Research plc and Acoustic Instruments International Ltd (T/A Cirrus Environmental). Eurolec Instrumentation Ltd is dedicated to providing compliant and high accuracy temperature and pressure measurement instruments and solutions to HACCP, industrial, laboratory and environmental sectors. With 40 years’ experience in the design, manufacture and supply of quality portable temperature and pressure instrumentation, our range of precision thermometers, probes, infrared thermometers, manometers and temperature calibration sources are exported globally providing solutions for a wide range of markets and applications. At Eurolec we are dedicated to providing the highest levels of product quality and service and through our commitment to product development, we continuously strive to address all application challenges in a progressing and dynamic industry.